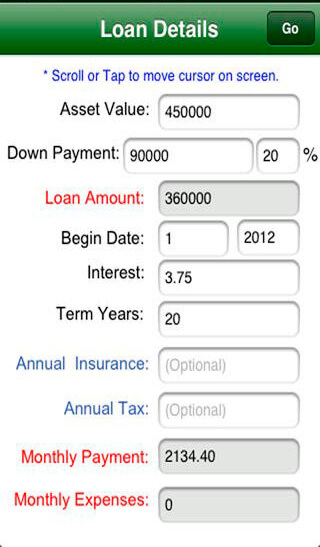 Smart Loan Calculator Pro will provide the most valuable financial information needed. It checks the affordability to buy assets and also SAVES LOT on assets you already own. 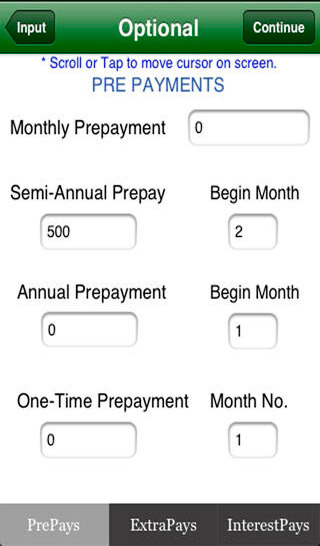 Who This Calculator is For:: Borrowers who want an amortization schedule, or want to know when their loan will pay off, and how much interest they will save, if they make extra voluntary payments in addition to their required monthly payment. 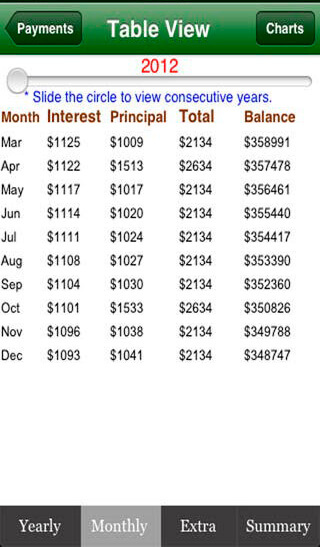 What This Calculator Does:: This calculator provides amortization schedules for mortgages, with or without additional payments. If additional payments are made, interest savings and reduction in length of loan are calculated. Quickly see how much interest will be paid and how much principal balance will be paid. Determine the effect of any principal prepayments. This calculator will help you to decide whether or not you should refinance your current mortgage at a lower interest rate. Calculate how much insurance coverage is right for you. Still many many features. Reports like TABLES and CHARTS are generated for a full yearly or monthly amortization schedule and how extra payments reflect your savings. 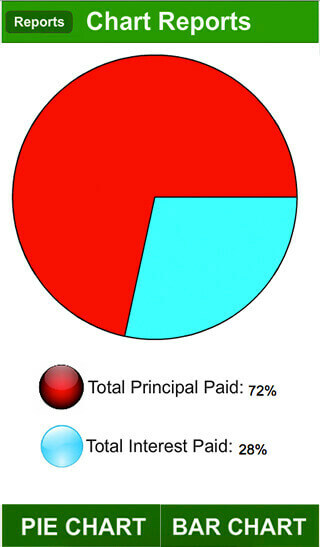 Charts like pie charts and bar graphs show how much amount is paid towards principal, interest, extras and expenses. Feature Provides the most valuable financial information needed. It checks the affordability to buy assets and also SAVES LOT on assets you already own. Great mortgage calculator for those considering or planning on purchasing a home. It allows you to figure the prinicipal, interest, duration and payment. It gives all the opportunity to input the various costs that you might incur - taxes / hoa's / other various expenses. So I think it will be very good estimator. Each time I change devices I look for this program. 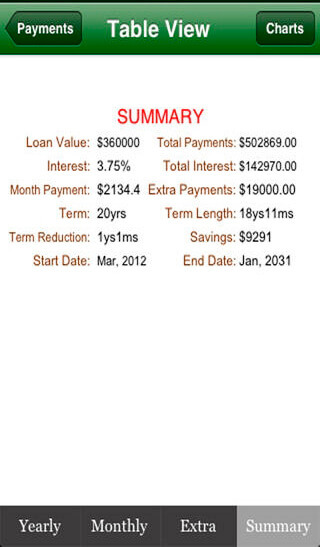 It is a very informative mortgage / loan calculator. Does a great job. Exactly what I was looking for to help calculate changes in variables while considering a home purchase. If you want a mortgage calculator you have several to choose from. I have tested several others and now only have this one. Easy to input, simple to run variations and the graphic options for output are the best. Very handy program to have for every real estate investor. I’ve been in search of a house for the last 6 months, and there were dozens of times where I learned from this product while walking through certain properties. I did some research and discovered there were a couple available…but Smart Loan Calculator had the most robust offering. This is the kind of information I was looking for. I love how this product breaks everything down, right down to the very penny of the last mortgage payment. Don’t bother with online mortgage calculators, just learn from this one!! You won’t regret it! This product really helps. It calculates all kinds of mortgage situations flawlessly. You can add in annual expenses such as taxes and insurance. You can even see the impact of making early payments or paying extra. You can go back and forth and do "what if" forever. It even does payment schedules. This is much faster than a web based payment calculator. Wow! It’s not only great for calculating mortgages, but it is also great for checking against auto dealers who always will play the “numbers game” with prospective buyers all the time. Tried several. But this is the most complete calculator to prevent waste and save money. I highly recommend this professionally designed and developed financial product which saved lots. Many excellent features are included in this product. But are not described here. Those who love to save, would surely love this product. All the financial calculators you need for a finance class is in this one. No need to excel formulas, website calcs or work-out with formulas on paper. It does compounding, has TVM, interest calculation, rounding, plus regular/miscellaneous calcs. Saved me ton of time and money. Great eye opener. 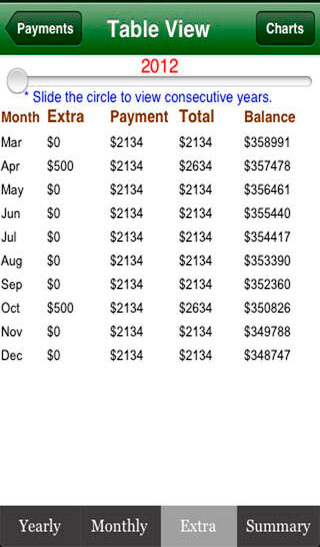 Simple to calculate the extraordinary advantage of extra payments. You can add in your taxes and insurance to give you your payment. Easy to input, simple to run variations and the graphic options for output are the best. Great for home buyers.